Why Is It Called Coyote Brush? As far as I can determine, no one knows for sure why this underrated native plant is called “coyote brush”, Baccharis pilularis. Perhaps the best explanation is that coyote brush (or “bush” as it is sometimes called) is very adaptable and comfortable in different habitats, soil types and climates. A similar suggestion is that it grows in the same habitat as that of coyotes; but coyotes aren’t especially particular about their habitat either, as long as their prey is available (an irreverent and scientifically untenable explanation is that it pops up wherever coyotes happen to have urinated). Another possibility is that the seed pods have a crown of white hairs that give the appearance of a mass of fluffy white flowers – maybe resembling coyote fur? More than one writer agree that it propagates very readily, both from its abundant seeds and from the roots, and that it “is very difficult to get rid of once established”, leading to the question of whether you consider it a blessing or a curse. 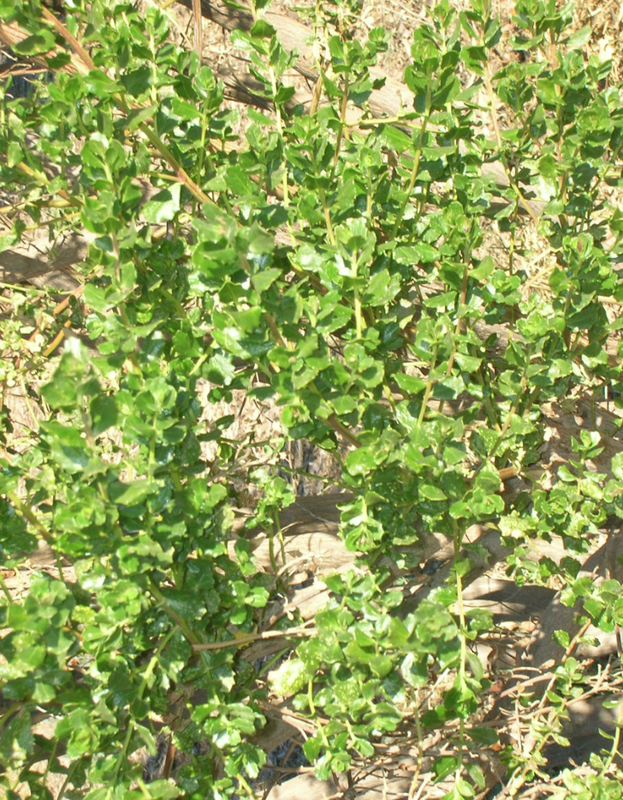 Another mystery is the origin of the scientific name, Baccharis. The name refers to Bacchus, the Roman god of wine and various convivialities, among other things. But how this is related to the plant, no one seems to be very sure of that either! Why Is It Underrated? I once learned that there is a fan club dedicated to the advance- ment and popularization of coyote brush. When one sees coyote brush growing in the wild, you might wonder what the attraction is all about. With its small leaves and inconspicuous, fluffy blossoms, it isn’t particularly appealing or showy. In fact, as it gets older, most of the growth is at the tips, and the branches look rather bare and skeletal. For this reason, many native plant gardeners recommend that older specimens be coppiced, that is, cut down to the ground every few years. Because of its large tap root system, the plant readily grows back. 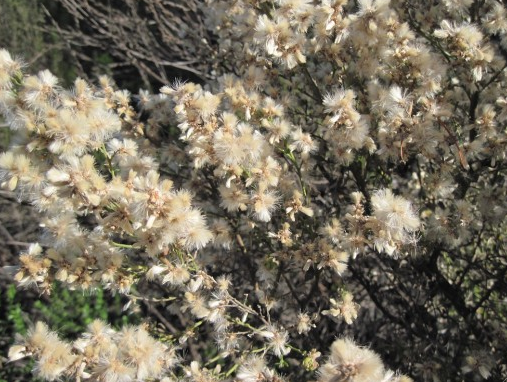 This is especially important after a fire or flood has devastated an area, because coyote brush is one of the first shrubs to appear after other plants have disappeared. For that reason, coyote brush is called a pioneer species. When someone set fire last year to a field of dry needlegrass at the Granada Native Garden, the coyote brush growing there was scortched on one side, so I cut out the burnt part. The photo at the right shows the re-growth just a few months after the fire. 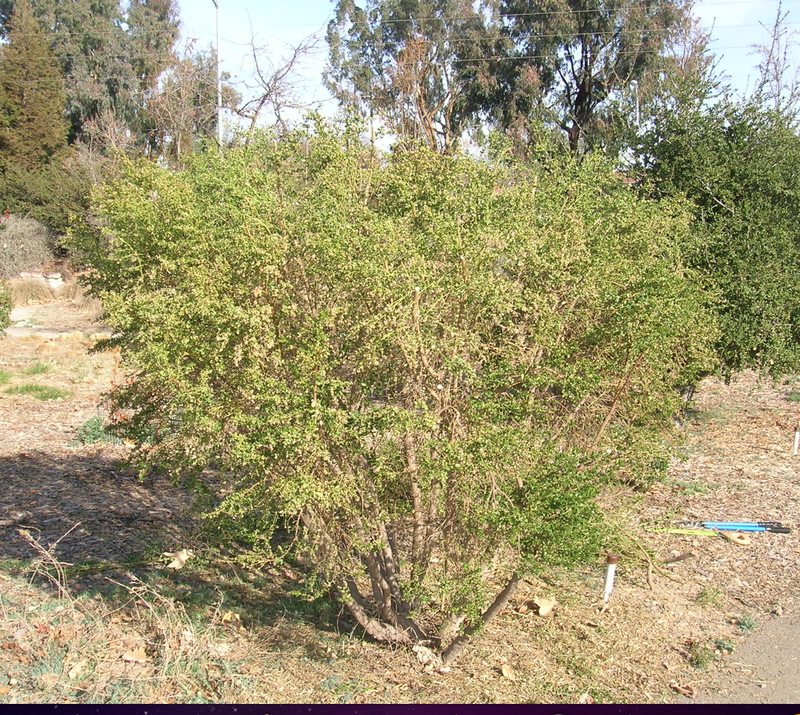 So although coyote brush isn’t exactly an eye-catcher, it is useful horticulturally for hedges and fence lines, and as a background plant where its 6-8 foot height towers above shorter plants, but it can get up to 12 feet high and looks best when it is cut back occasionally. The specimen in the photo at the top was planted from a seedling only 2-3 years ago in poor soil and was watered only for the first year, and not very regularly at that. So it isn’t particular about its habitat. Like a coyote. 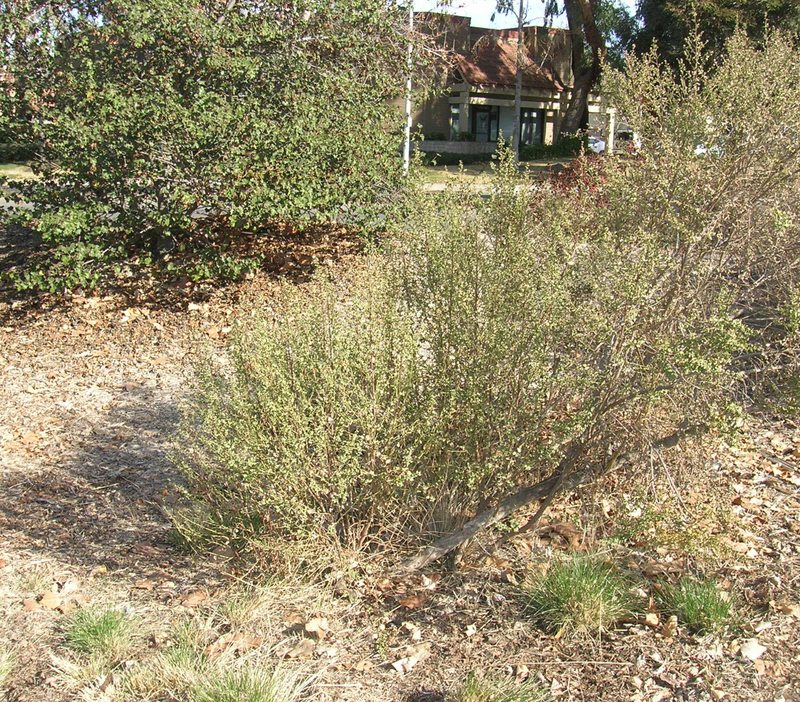 However, there is a dwarf form of coyote brush, ‘Pigeon Point’, which is highly regarded as a low-growing ground cover, especially for a slope where erosion control is important. In addition, it is fire-resistant, has dark to medium green foliage that contrasts nicely with ceanothus (California lilac), toyon and manzanita, and doesn’t get woody in the middle. An Insect Magnet Coyote brush fans and admiring horti-culturists aren’t the only ones who prize coyote brush. It is an important habitat plant for birds and butterflies, and attracts predatory wasps, skippers and native butterflies. Las Pilitas Nursery says that “you will see the weirdest bugs on these plants”! The plant is dioecious (“dy-ee-shus”), which means that male flowers and female flowers are found on separate plants. Furthermore, it flowers at the end of the summer and into fall, providing a late source of nectar and nutrients for insects that need to over-winter. are said to have a honey-like fra- grance which attracts many butter- flies. 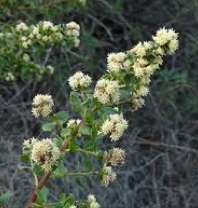 One native plant devotee reports that “Long before I knew what coyote brush was, I noticed its delightful and aromatic herbal fragrance when hiking near the Sonoma Coast, where it grows in profusion”. When we lived in Sacramento and I often biked along the American River Bicycle Trail, I enjoyed the medicinal odor of sagebrush (Artemesia), especially on hot summer evenings when the odor can easily be detected in the air, and of coyote brush, which reminded me of motor oil. Lori, a friend who visited us recently, asked me if there is coyote brush in our yard, because she could smell it even from a distance. There is, in fact, one single coyote brush in one corner of our yard; Lori eventually concluded the aroma reminds her of dill. As if to agree with Lori, another commentator describes the fragrance as “unmistakable” and “intoxicating”, like “a fresh blast of sweet dill and sea air”. Still another says that the male flowers smell like shaving soap. In any case, the aroma (and taste) apparently seems to help protect it from being eaten, especially by deer. Whatever it smells like, it is just something else that contributes to our pleasure and enjoyment of California native plants! We have introduced three important concepts in this post. Without looking back, see if you remember what is meant by these terms: pioneer species, coppice, and dioecious. No cheating now! The Practical Film & Media Workshop The Practical Film and Media Workshop is a vocational program designed to provide adults with developmental disabilities an initial entry-level working knowledge of film produc- tion and related industries, then to build those skills over subsequent twenty-week work- shops. 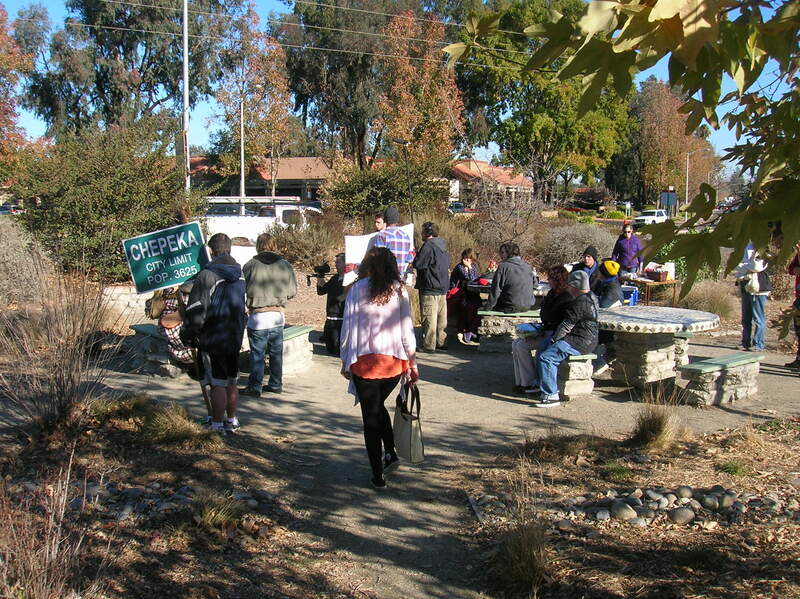 Late last year, the PFMW chose the Granada Native Garden as a site to film a skit written, played and directed by the students of the Workshop. The weather cooperated nicely, and the event exceeded their best expectations. The skit involved the inhabitants of an small fictitious frontier town, Chepeka, and one individual who has prophetic powers and is warning of an impending catastrophe. None of the citizens believe him, until he is befriended by one special person who convinces the citizens of Chepeka of his authenticity. In the end, Chepeka is saved (if you can overlook the 21st century evidences in the background)! Many thanks for another great post about yet another great CA native plant. Love the Pop Quiz section, what a fun idea! And, thanks for sharing photos of the PFMW skit. GNG is a good location for so many different venues, from family picnics to filming skits! My favorite story about how the plant got its name is that it comes up everywhere coyote stops to pee! Yours is the first post I’ve found in the web highlighting the scent of coyote brush. I’ve smelt it in three different places in the Bay Area and each time I’m entranced. I didn’t know what I was smelling so I recently contacted a landscape designer to help me identify the plant and that’s how I learned its name. I cannot describe what I smell but I love it. I’m glad you mentioned that you can smell it at a distance: I find that I can only smell it at a distance of 5-15 feet! When I get close to the plant sometimes the smell seems to evaporate. Thanks for writing this post. Good to see another supporter of the resilient and ever-green coyote brush. I came here wondering about the name, and learned to sniff for the fragrance. I also blogged about it being under-appreciated a while back. I’d just like to add that they can be attractive also when – sort of lion-tailed. You can get rid of the hairy thin twigs on the stems and create quite an elegant airy look. it can last several years. Coppicing is also great – and leaving a few to just do their thing is fun too. I have some that are over 15 feet tall along a property line. Love em! I wonder if this delicious smelling herb can be used as a tea? Is it safe to drink? I haven’t seen any evidence that coyote brush can or should be consumed, either as a beverage, food or medicinally. I would not advise it. Just enjoy the aroma and the bees and butterflies.